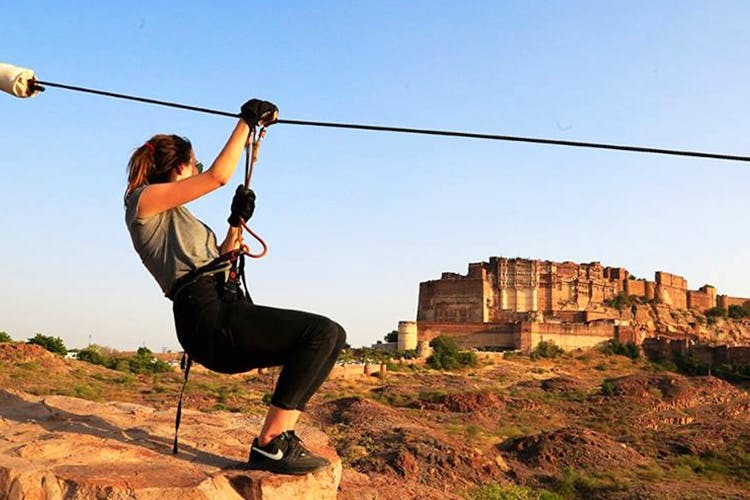 Flying Fox in Jodhpur gives you an all frills zipline tour in and around Mehrangarh Fort. If you happen to be in Jodhpur and are looking for a crazy fun-filled day flying around (quite literally) the fort, then this is the best thing to do. If you love or have been wanting to try out ziplining, then this is for you. There is no restriction on who can try this out but yes, they do mention that younger kids need parental guidance, but it is totally safe for anyone to try out. You get to fly over the battlements of the fort and get a panoramic view while you’re zipping across at adrenaline kicking speeds. They’ve set up six ziplines around the fort for you to ride on. The entire tour takes around 90 minutes which includes safe briefings as well as short walks in between each location. They have ziplines ranging from 70m to 300m. The prices start at INR 1,700 for adults if booked online. INR 1,899 if booked on the spot. They give attractive discounts for students and children so you can check with them on that.